It’s been a while since I last dove into Carriger’s world, so I did a mix of audio and reading to catch up and be ready… and let me say: if you enjoy the twists, turns, occasionally ridiculous moments from any of her earlier works in the worlds of Finishing School or the Parasol Protectorate, you will enjoy this. And if you are unfamiliar and want a steampunky-paranormal world with language and characters that evoke emotions- start with either – although I’d recommend Finishing School to get a solid sense of them. 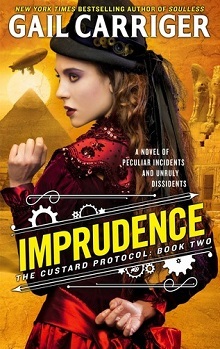 In Imprudence, the story picks up almost exactly where Prudence left off, and we are travelling in the Spotted Custard airship with Lady Prudence and her crew. She’s encountered a spot of trouble with the Queen herself (yes, Victoria) for her part in protecting weremonkeys, and has been stripped of her title and protections, including those provided by her parents. But, she’s not truly the one most endangered here: with lion shifters in danger, her best friend Primrose unable to resist a finely turned leg and a trek to Egypt – the action is non-stop. As with all of the series thus far: the dialogue is clever, fast-paced and often hilarious. While I didn’t always believe in her romance with Quesnel, their interactions do bring several laughs – they are adorable friends. Of Course, Primrose is great comic relief, she just can’t seem to stay focused on any one thing, until the chips are down. Fast paced, full of adventures that expand the world for the crew of the Spotted Custard, the story has reached a solid stopping point as we await the next. Narration for this story is provided by Moira Quirk, and she does manage to present both sides of every conversation with clarity and style: each character is distinct, the rapid-fire moments of dialogue don’t impede her forward progress, and there are appropriate pauses for breath, laughter and tension (when required). Quirk’s presentation is a wonderful adjunct to the books, and she keeps listeners interested without losing their place or thread of the story. A wonderful last-for-now (2018 for the next) book in the series, leaving you plenty of time to catch up or simply enjoy the other books from this world. Primrose keeps getting engaged to the most inappropriate military types.